The cake part just looks like chocolate cake and to most will taste like chocolate cake, but it is the moistest cupcake you will ever taste! It feels like soft cake when you bite in but then it just melts away. The frosting will be a bubble gum pink, colored with beet powder (available at Kalustyan’s or on-line), but will taste like the forever lovable, creamy cream cheese frosting. Only two people I know were able to guess what the secret ingredient was and every single person that tasted it LOVED it. It gets even better. Beets are good sources of iron, potassium, niacin, calcium and lots of vitamin A and C. This might be a good way to sneak it in for the little ones…or the big baby. 1. Preheat oven to 375 degrees F. Line muffin tins with paper liners. 2. Melt chocolate (70% dark provided by Askinosie Chocolate) and 1/4 cup (4 tablespoons) butter over a double boiler. Set aside to cool. 3. Cream together 3/4 cup (12 tablespoons) butter with brown sugar in a large bowl with wooden spoon or paddle attachment on a stand mixer. Add eggs one at a time and mix well after each addition. Beat in chocolate/butter, beets, and vanilla. It’s ok if it looks clumpy. 4. In a separate bowl, combine flour, baking soda, and salt. Stir flour mixture into the batter and mix well. 6. To make frosting, sift together confectioner’s sugar and beet powder. Set aside. Beat cream cheese, butter, and vanilla extract with a paddle attachment on a stand mixer on medium speed for 5 minutes. Reduce to low speed and gradually mix in confectioner’s sugar with beet. When it is all incorporated, return to medium speed and beet for 5 more minutes. 7. Frost cupcakes once they are cool. Remove roots and tops of beets. 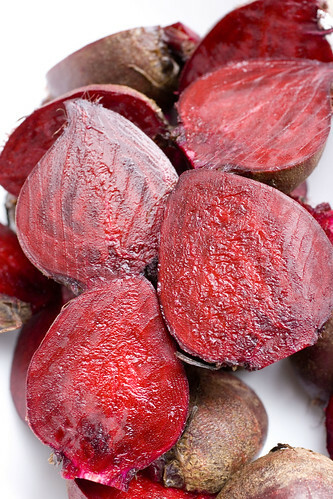 If you are using small beets, cut them in half. If you are using medium or large, quarter them. Place beets in a pot of water and bring to a simmer. Cook for 30 to 40 minutes or until tender. Run the beets under cold water until cool enough to handle. Remove the skin (which comes off easily just by rubbing with your fingers). 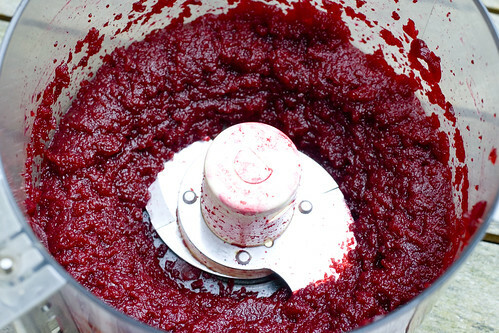 Place the beets in a blender or food processor to puree. Allow to cool before using in this recipe. For scant 2 cups of beet puree, I needed 10 small beets. posted by jessica	at 09:50 AM	Filed under Desserts, Recipes. You can follow any responses to this entry through the RSS 2.0 feed. Both comments and pings are currently closed. kool! Does it actually taste like beet? I actually don’t like it in my blended juice. I am not a huge beet fan but the color is really pretty! these blow away all those cupcakeries in NYC! 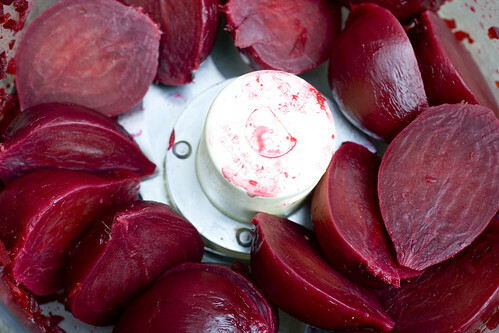 we love roasted beets..so sweet and nutty, wonder what it would taste like if you roast them? Beets? This is up there with black bean brownies. Sounds odd. 🙂 Heard that they are both excellent in these sorts of treats though. 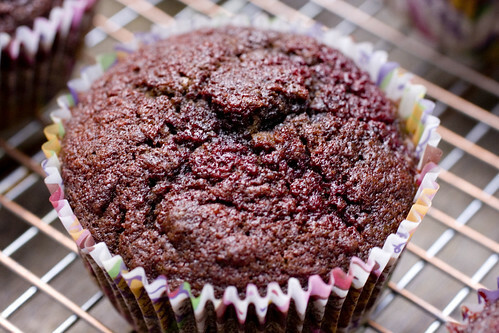 I’m a big fan of cupcakes…and beets. 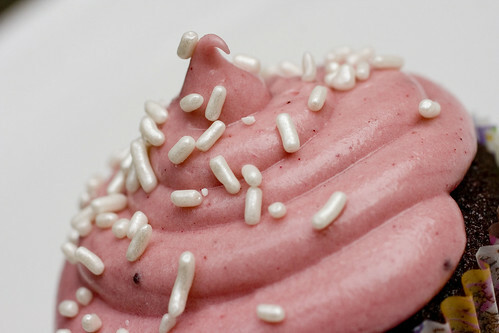 Your cupcake looks beautiful, and the idea to use beets for color and flavor is very cool. I think I’ve got to try to make these! Kim and Dolce, most people do not taste the beet at all. Longislandette, don’t forget to send us pics! Oh, I have to make these! I love beets and have a bunch still left in the garden.Thank you for the great post and scrumptious pictures! I bookmarked it! Love your swirly frosting on top! What FABULOUS & yummie cupcakes, but I prefer withoutthe frosting!! I love beets & chocolate together! I love your site! This is such a good idea, and I was thinking about doing it for a baby’s birthday because her parents were slightly shocked by my Red Velvet cupcakes last time 😉 Also, I love your recent California posts – I’m headed that way soon so it’s perfect, thanks for the recommendations! Food coloring is evil (especially bad for kids). Great job. Btw, I’m cooking w/ burdock (gobo). It’s the BEST, please post about it. Dana, I bet it will be even better with fresh beets from your garden. Sophie, I can usually do without frosting too, but I make it for everyone else. Mango, thanks! Don’t forget to send us some pictures! Wow, I’m flippin’ impressed! 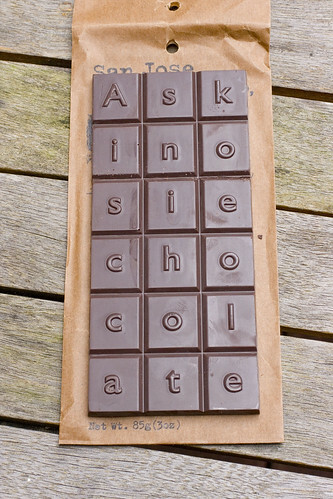 I love the photo of the Askinosie chocolate. I was trying to sound out the message in my head, it was funny. Pam, thanks for the link. It was very helpful. I’ll have to start more experimenting. Ooooh, that cupcake is lovely. The swirl of frosting is absolutely perfect — any tips on getting it so uniform? Love it! Can’t wait to try the recipe. I think I’m going to make it for my birthday cake this year. 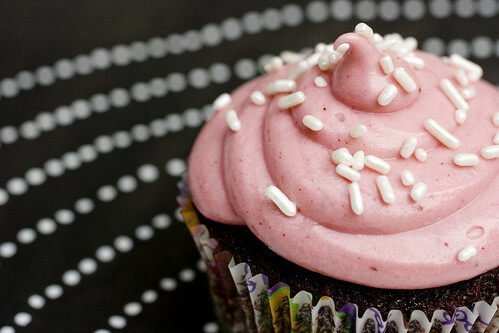 Any idea how to make purple icing? (I can’t do food colouring either). Thanks!! Sarah, I think that when the frosting is softer (being room temperature on a warm day), it settles in smoother, but don’t let it get too soft, or it will slide off. Carrie, hmm…purple is hard because you need blue in it and there isn’t that much in nature that makes blue. 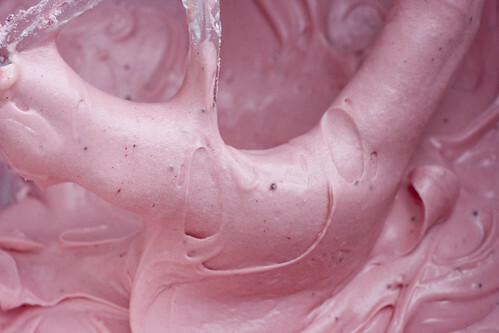 Try making this frosting (with the beet powder) and mixing in a little blueberry juice. I tried the blueberry juice and it turned out all right…pale, but pretty. Great idea! Yay Carrie! Thanks for letting us know. Do you have pictures of it? I couldn’t find beet powder near me so I used 1T of reserved liquid from cooking beets and got great pale pink color without changing consistency. I have made these twice in as many weeks. I will be making this recipe asap. It looks great and as was noted beets are especially good for you. My wife loves purple, as do I so the blueberry and beet powder will be great. Her parents will flip!! I love cupcakes but am scared of beets! I showed this recipe to my husband and he’s wanting to try it out. My family loves Red Velvet cake but I really don’t like the idea of feeding them red food dyes. This recipe seems like a great alternative! I had these at a friend’s party last night… do NOT taste like beets, (I was stunned when she told me the secret ingredient) just like rich, luscious chocolate cupcakes. Yay! Thanks for letting me know – so appreciated! If anyone wants me to put up one of their pics in our fan pics section, let me know. Any suggestions for adjusting timing to make this into a layer cake? I would love to make it for my daughter’s birthday. Becky, I haven’t tried it as a layer cake, but try doubling the recipe to put in 2 (10″) or 3 (9″) cake pans at 375 degrees F. My guess is to start checking 9″ cakes at 35/40 minutes and 10″ cakes at 60 minutes. I love this cake sooo much! I have made it for my daughter’s birthday the last two years (her 4th and, at her request, her 5th). No one could taste the beets other than it’s more moist than most chocolate cakes. One of my friends is a baker by trade & she raved about it. 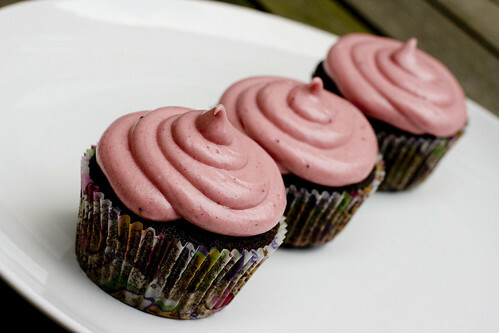 I use a cream cheese frosting w/ the beet powder to make it pink. Delish! Thank you! Devon, that makes me so happy! Snap a picture for me next birthday please!! I’m not allergic to the food coloring but can’t stand the flavor of a whole bottle. This is a wonderful replacement for red velvet cake. I’ve made these several times and have gotten many veggie haters to eat them without even knowing. MIL even said this was the best red velvet cake she ever had. Veggie likers are just amazed at the color, flavor and texture. 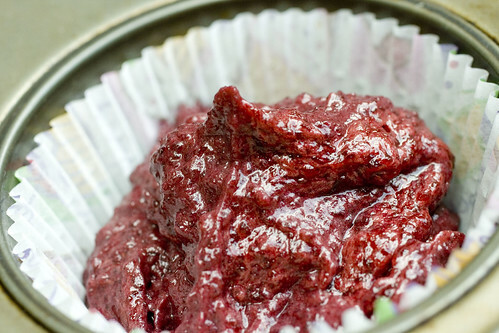 I roast the beets (makes them a bit sweeter) then use the remaining liquid in the pan to color the frosting. I also use baking powder rather than soda. That much soda tastes funny and the powder helps keep a bit of the red color. Thanks for sharing a wonderful recipe!